Raccoons Rags: SSP-047: Sewing pattern for playsuits for Kaye Wiggs dolls. SSP-047: Sewing pattern for playsuits for Kaye Wiggs dolls. Isn't it typical, you wait weeks for a pattern to come out, and then two come along on the same day. This one is for both the Kaye Wiggs MSD sized bodies. It took some working out, but I've ironed out all the wrinkles (if you'll pardon the pun) and the outfits are looking good! The pattern includes two bodices, one for Mei Mei, and one for MSD. Although both bodices will fit both dolls. The skirts and bloomers are a little longer on the Mei Mei body, and still look charming. There are also two waistbands for petticoat, and two for the bloomers, each sized to fit both dolls. I do give instructions on how to make one dress, petticoat and pair of bloomers to fit either doll too. So you can make something exclusively for your MSD, or exclusively for your Mei Mei, or an outfit that both your different sized dolls can share. The petticoat is the same for both versions. As you can see, to illustrate my publication, and to test all my patterns, I had to sew four outfits! I was up to my ears in petticoats at one point, because I kept getting confused over which doll I was sewing for. Because the petticoats are the same for both designs, I just... yeah. SO MANY PETTICOATS. I don't know what to do with them all, but I'm sure I'll make outfits in the future that I can team them with. The result is well worth it though, even if I did post on Facebook tearing out my hair. And it's always fun to dress up my girls in their finery and play with wigs. I adore KW dolls with all my heart, and I've been incredibly naughty... I've bought sunkissed human Missy on pre-order. I am SO excited. But have to wait until September. At least by then I'll have paid for most of her. 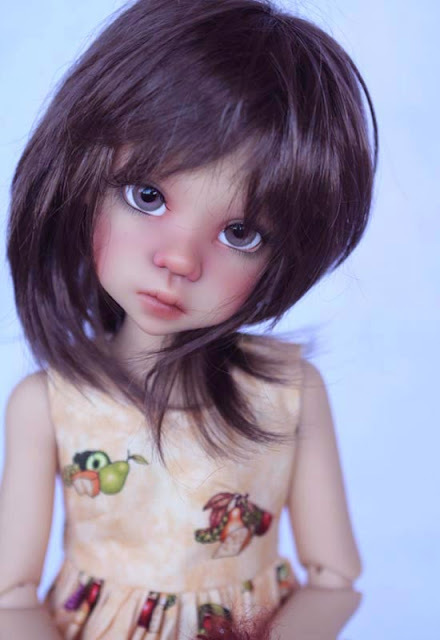 Here she is... Not my picture, it's from Jpop dolls. Such a lovely sculpt. Kaye is gifted. Her dolls are so much fun. That's it for now. A short break to try and make shoes, then back to the drawing board for something new to sew! Gorgeous outfits and congrats on your Missy - she looks lovely! I've looked at the mini Layla a few times but still haven't crumbled! I think I'll probably stick with looking enviously at your lovely girls!! September is so far away, but yes, I'm well excited to get such a nice sculpt. I've discussed the mini doll's measurements with someone on FB and she seems fairly similar to Patience. We're not sure about the thickness of arms and legs yet though. I may ask someone who has one to get measurements for me. I saw they were 14" which is probably why they appealed knowing how I love my Patience girls! !